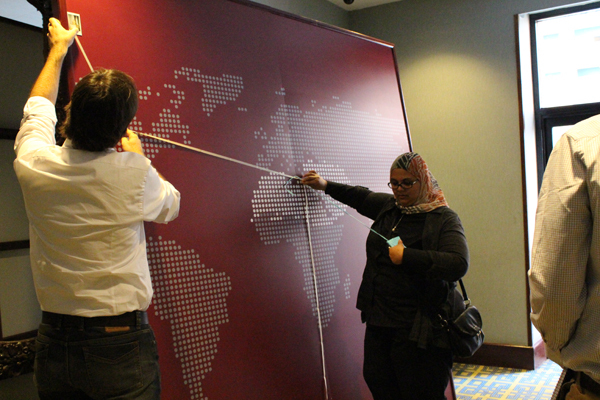 Mapping ERF's Global Reach at their 20th Anniversary Conference! CommsConsult are in Cairo for the weekend as part of the social reporting team for the Economic Research Forum’s 20th Anniversary Conference. Whilst focusing on many of the pertinent issues currently effecting the Middle East, with a theme of ‘Social Justice and Economic Development’, the conference is also a celebration of the last 20 years of ERF’s work and chance to look forward at what the next 20 years might bring. Our team have been working hard to come up with some special ideas to not only mark this occasion but give those that have traveled to the conference a chance to engage with each other and express what ERF has meant to them over the last 20 years. We finally came up with the idea to produce a huge map of the region and take Polaroid snaps of participants, marking with string where they are based, the reach of their main ERF projects and quotes about what they feel the impact of ERF has been for them – creating a huge web of ERF’s influence. The conference officially starts tomorrow, but we have already bagged a few participants to get involved. 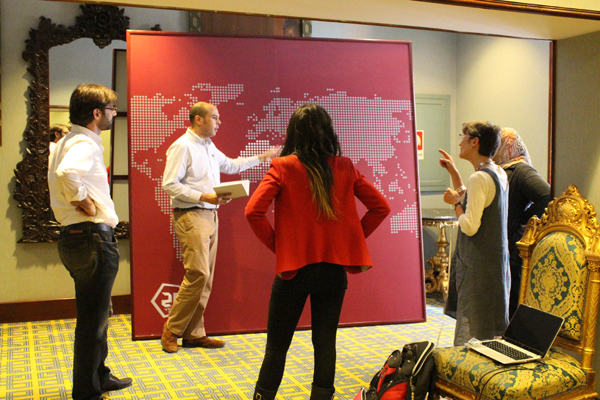 To the left are Pier Andrea Pirani and Shahira Emara from the conference communications team, deciding how to put the map together. We can’t wait to see how the final map looks! If you are attending the conference and want to get involved, please come and find us tomorrow – we look forward to seeing you! For other updates from the conference (we will also be producing talking head videos, blogs, twitter updates and more!) follow #ERF20 and check out the ERF conference blog.